The car2go app is the best way to see which cars are available and where they’re located in Vancouver. Don't have the app yet? Check out a high-res version of the map here. car2go offers you ultimate parking freedom. 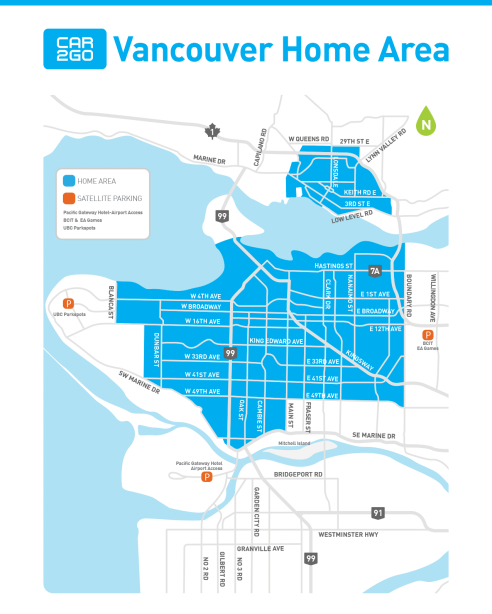 To end your rental simply park your car2go on any approved public, on-street parking within the Vancouver Home Area. The best part? It costs you nothing. Where to park: It's pretty simple: as long as you end your trip in any approved public, on-street parking space, you're good to leave the car and go. Just be sure to check our parking rules below for where you can and can't park. VIP parking: certain parking spots in Vancouver are reserved just for car2go members. Look for blue Ps on the app- the number indicates available cars (lighter blue Ps means there are no available cars there).Tap the P to view the number of available parking spots. Public street parking with signs reading "2 HR Parking"
*Further restrictions include: No parking or stopping zones, on-street spaces where parking restrictions will apply in the future, etc. Since you never know when another car2go member will use the car next, a trip should never be ended in a further restricted parking space regardless of when the restriction begins or ends. See 'Where you can't park' below for more info. Spaces designated for specific vehicles: non car2go Car Share Spaces, Taxis, Delivery vehicles, Law Enforcement Vehicles, Motorcycles, etc.